ML algorithms study is regarded to be the ‘Sexiest job of the 21st century’ as shown in the Harvard Business Review article. 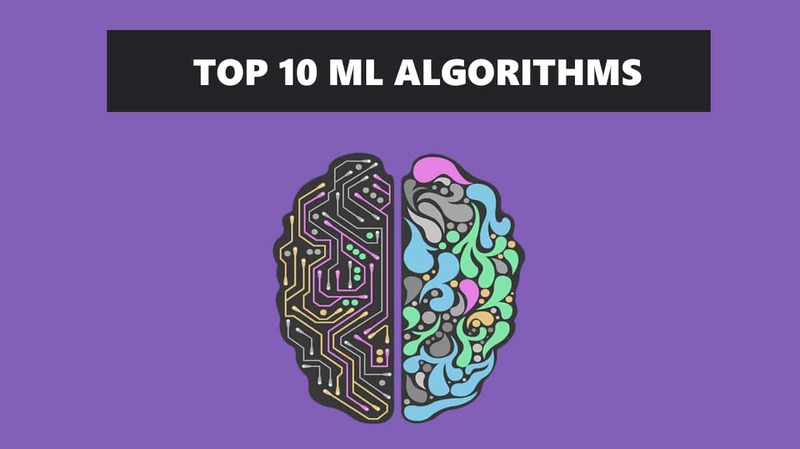 For beginners who are eager to study Machine learning basics, here is a great quick guide to the top 10 Machine Learning Algorithms used by ML programmers that you must know. Machine Learning algorithms do not require human intervention, they are able to study data and advance from experience. Learning data entails studying the function that plots input and output and studying the unseen structure from unlabeled data. Ensure you choose the right machine learning task that is appropriate to your problem. Try different Algorithms for every problem to evaluate their performance and then choose the best. A basic understanding of varying types of ML Algorithms will enable you to understand better on how algorithms work. Supervised learning is described as training where algorithms use labeled datasets to plot the function from input to desired output variable. The algorithms are trained under supervision to reach a certain judgment to enable them to execute the practices later on its own. Association: In this type of learning the probability of re-occurrence in a group is learned. It is largely used in market analysis. For instance, if a buyer buys a book, the probability of buying a pen is 80%. Clustering: In clustering, the aim is to find similarity in items of the same cluster as opposed to items of another cluster. This approach works best where data is sufficient to give meaningful outcomes. This type of machine learning algorithms allows the agent to use reward feedback in order to reinforce a behavior. It learns by relating to its surrounding environment rather than by being taught. They are usually used in robotics. Robots basically learn through receiving feedback and exercising trial and error to know the next course of action. Linear regression is the easiest of all algorithms to understand. It shows the relationship of variable(x) in relation to variable(y). It illustrates the effects of a dependable variable where change occurs in the independent variable. Its commonly used for presentations by insurance firms, forecasting sales, and analyzing risk assessment in health. Logistic regression technique is effective for the binary classification. In logistic regression, the output is a probability that ranges from 0 to 1, unlike linear regression where an output is produced directly. logistic regression can be used in events that require more logic for a prediction like when forecasting weather conditions, during voting to know whether people will vote for a certain candidate or not. The objective of logistic regression is to reduce the error between the forecast outcome and the real outcome by using the training statistics to know values of coefficients b0 and b1. Maximum Likelihood Estimation technique is used to estimate the coefficients. The decision tree includes the non-terminal nodes represented by the root node and internal node and terminal nodes. Terminal nodes are represented by leaf nodes. A single input variable (x) presents a certain non-terminal node and a split point on that particular variable. The leaf node shows output variable (y) which makes a prediction. When using the tree model to make predictions, you walk through the splits of the tree up to the leaf node and output the value shown at the leaf node. Naïve Bayes is a simple but powerful algorithm. This probability model calculates data using Bays Theorem. The Naïve algorithm got its name from the assumptions that variable input is independent of each other. This Algorithm is used for indexing score, ranking pages and sorting data categorically. KNN (K nearest neighbors) is an ML algorithm which is effective and simple. It uses the whole training dataset. When new data outcome is required the algorithm searches for the most similar K examples through the whole training set and summarizes the K instances output. Also Read: Algorithms or Human Beings – Who are the Better Decision Makers? Market basket analysis widely uses Apriori algorithms to look for combinations of things that regularly co-appear in databases. The relationship rules are made after the threshold for support is crossed. The principal behind Apriori is that if a set of items is common, then all subsets related must be common. K-means is a Machine Learning Algorithm used to collect related data into clusters. It works by classifying unstructured data into different ‘K’ groups ‘Each dataset comprises a collection of structures and the algorithm orders the unstructured data and classifies them in relation to specific features. Principal Component Analysis (PCA) is used for speeding exploration of data and making correlations by minimizing the number of variables. Maximum variance in the data is taken into a different coordinate structure with axes named ‘principal components’. It categorizes patterns in items and targets to make correlations of variables in the items data. Whatever relationships the PCA finds is shown on a similar (but smaller) dimensional structures. The algorithm is used in applications such as, stock market forecasts, gene expression study and in pattern grouping tasks that overlook class labels. The Random Forest ML Algorithm is used for both grouping and regression analysis jobs. It forms forest using trees and makes the trees random. Random forest is almost similar to the decision trees algorithm, the main difference is that nodes are splinted on random features, then the best split is chosen but it ends with alike structures and related predictions. Thus after creating a random decision tree, the final prediction is determined by outcome with high votes count. This algorithm is normally used in industrial applications. I presume the algorithm “KKN”, reported at Serial Number 5, would be “KNN” (k neatest neighbor).